First of all, I apologize in advance that this is the only outfit post from Sarasota. Tre and I were planning to document our trip, but we got so caught up with hanging out with family that we forgot we brought a camera with us. We had a great time (as always)! We were loving the sun, warm weather, and hanging out at the pool every day (as you can see in my Instagram photos haha). We also walked around St. Armands Circle and shopped, went boating, and did a lot of relaxing. Looking at these photos are giving me vacation withdrawals. 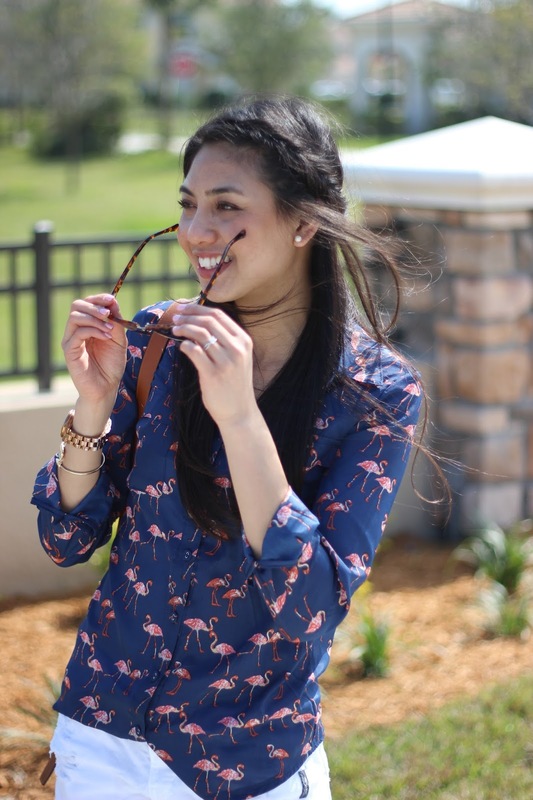 Before we went to Sarasota, I came across this flamingo shirt from Sheinside. For some reason, flamingos remind of Florida so I thought it was fitting for the trip. Plus, they look so cute on the shirt! Unfortunately, I did not see any flamingos, but I did see a lot of flamingo printed stuff. So I knew I fit right in! Love your shirt! So cute with the white shorts!! I absolutely love this look! That shirt is adorable, and your pink shoes are so cute! How cute are YOU! 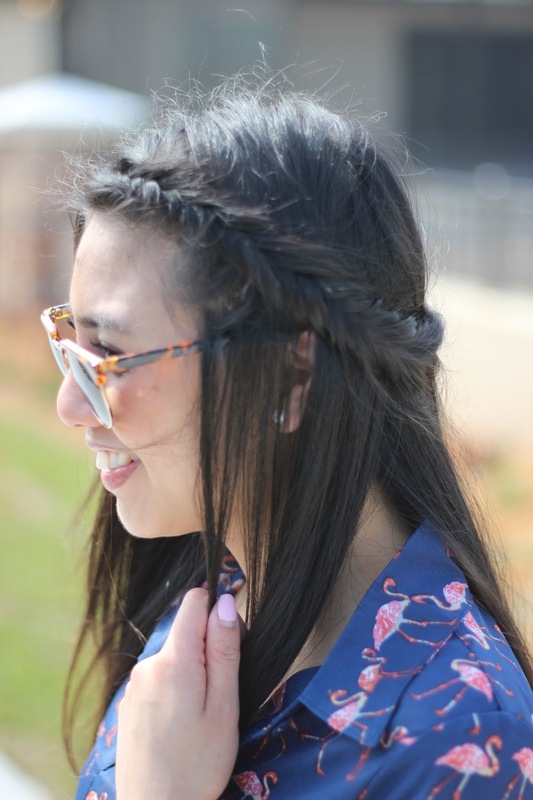 I love this flamingo top! I love this look. And I am right there with you- I always associate Flamingos with Florida! Glad I'm not the only one! Thanks Clare! So glad to hear I'm not the only one haha! Thanks Vanessa! You're always so sweet! I'd say it was a good trip if you had so much fun you forgot to take pictures. Love your white shorts a braid! This outfit is so cute! 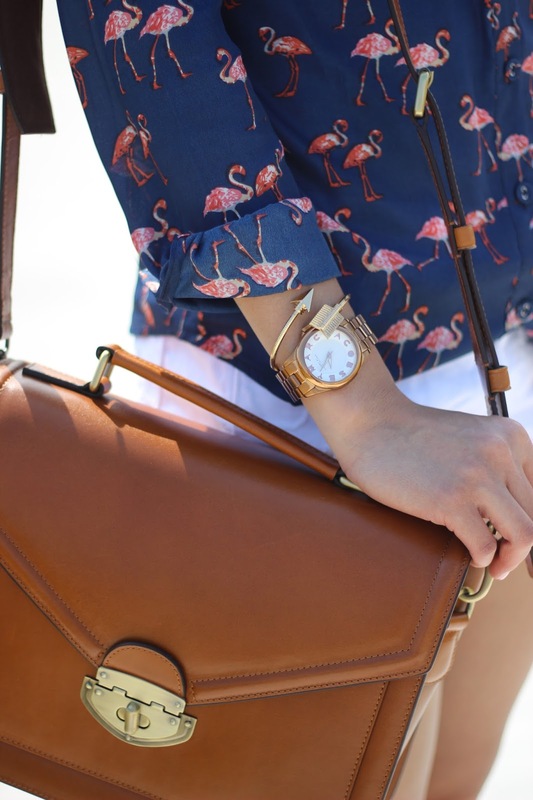 I love, love, love the flamingo shirt and the gold accessories…so pretty! Such a beautiful shirt and love your hairstyle. Love this Rach! Happy to hear you guys got lots of relaxing and pool time in. You look adorable! So so so so cute! I love the shoes and the top together! Not sure which part of the outfit to comment on first because the whole thing is perfect! 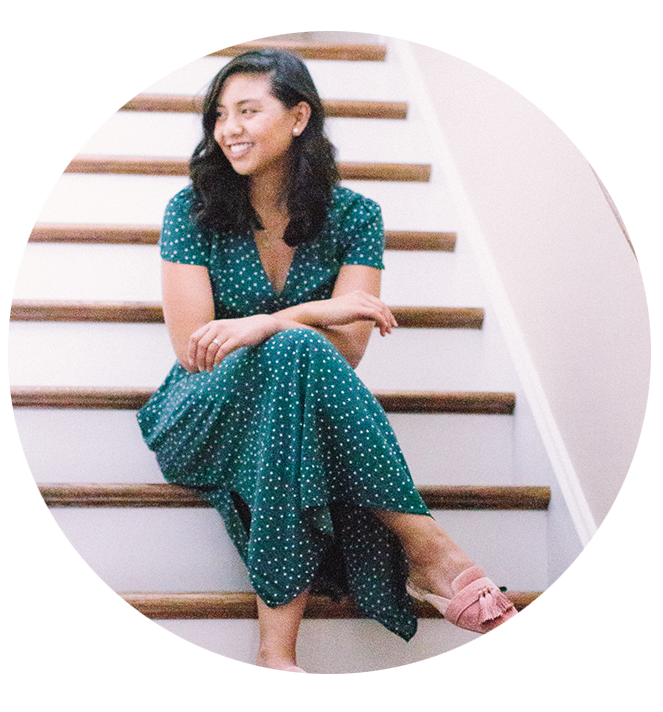 I am dying to get some cut off white shorts this summer–time for me to start tanning my white legs I guess! Also, do you do hair tutorials? I am digging the fishtail but I can't seem to do them on the top like that. Aw you are too kind Samantha! 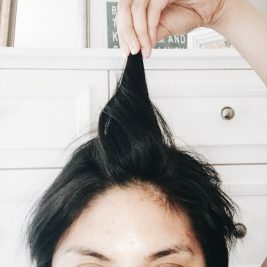 I'm considering doing a hair tutorial.. maybe in the future I will! Thanks so much for stopping by! 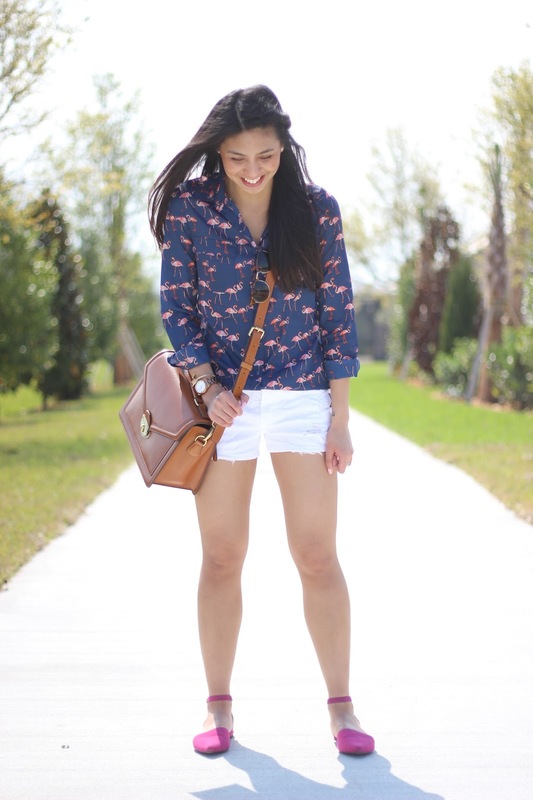 Such a fun, feminine outfit! I adore the printed shirt. Have a great weekend! 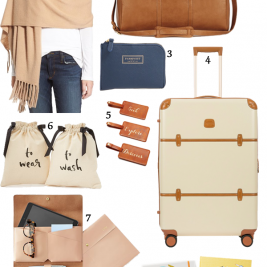 Such an adorable spring/summer ensemble. I love your flamingo top! Too cute! 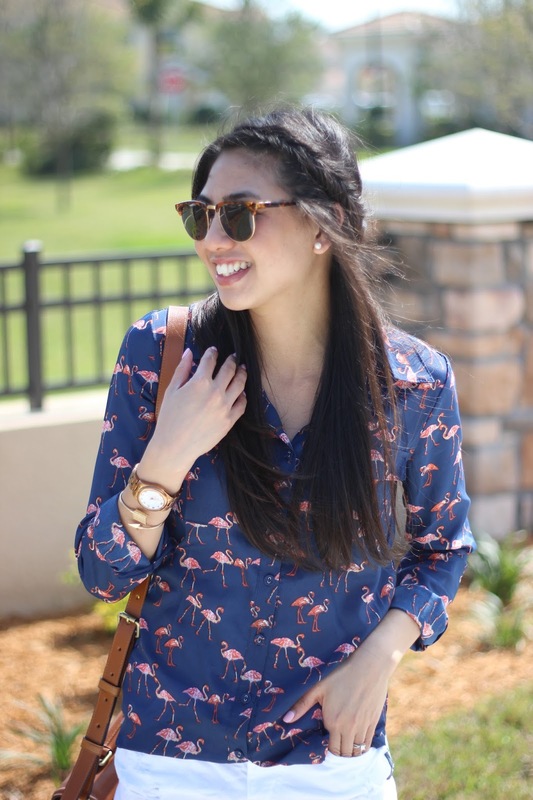 The shoes are perfect with your flamingos! Flamingos all the way! I am loving this outfit:-) You look beautiful and I love how you styled it. 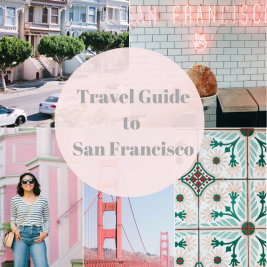 Hope you had a great trip! Thanks Elizabeth! We had a wonderful time! Ahhh I want summer!!! 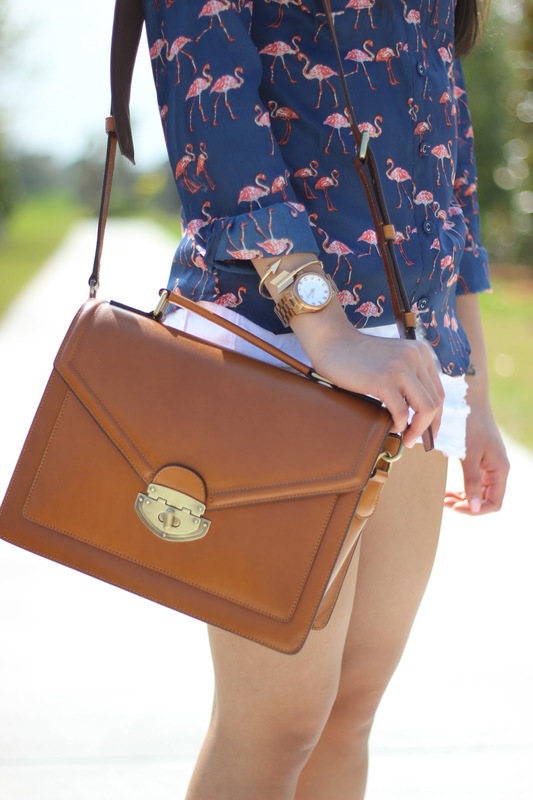 Stunning look and super cute bag! Thanks Fiona!! I know, I want summer too! love the flamingos!! hope you both had fun! Thanks Andrea! We sure did! I love your swan top. I love this look! So casual and pretty!